I felt like making brownies today, but started feeling guilty because I always make brownies and should challenge my culinary horizons. So I made frosted brownies. 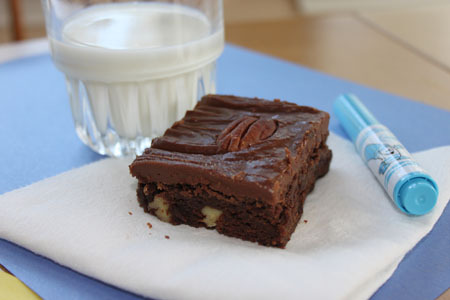 This frosted fudge brownies recipe is adapted from one of the new Hershey books that I brought home from a trip to PA. The title is “Best Fudgey Brownies”, and since I couldn’t find the recipe in the brownie section of the Hershey Kitchen, I typed up my version below. They taste great, but a little salty. Then again, everything tastes salty to me today. I’m getting over a cold and can’t shake this salty metallic taste. It’s annoying. So it’s me, and not the brownies because even water tastes salty. Another thing I like about these brownies is the texture. They’re fudgy (which I guess can be spelled with or without an “e” or with “ie” if you’re referring to Fudgie the Whale) rather than cakey. They remind me of the brownies you get in the grocery store bakery but fresher and better tasting. Rich fudge brownies with a cooked fudge frosting. Preheat oven to 350 F. Line an 8 inch metal pan with foil and mist the bottom with cooking spray. Melt the butter in a microwave-safe bowl. Whisk in the sugar, then whisk in the eggs and vanilla. In a separate bowl, mix together the flour, baking powder, salt and cocoa powder. Gradually add flour mixture to the batter. Stir in the pecans (if using). Pour into pan and bake for 20-25 minutes (I baked for 20). Pull from oven and make frosting. Frosting: Stir together cocoa powder and powdered sugar. If you have time, you might want to sift it. Melt the butter in a saucepan. Add the milk. Stir it into the chocolate/sugar mixture. Stir in the vanilla. Add pecans if using. Pour over the warm brownies and kind of spread it a little to cover. Garnish with pecan halves. Let brownies cool completely, then chill for several hours (this makes them easier to cut and neater). Lift from pan, set on a cutting board, trim edges and cut into squares. Here's another method for making the frosting. I sometimes use the one above, and I sometimes use this one depending on my mood. I think this one's a little smoother. Icing: Sift the confectioners’ sugar into a mixing bowl and set aside. You can skip the sifting step if you must, but sifting helps it to blend easier and the icing will be smoother. Melt the butter in a saucepan set over medium heat. When butter is almost melted, add the cocoa and milk and bring just to a boil. As soon as the mixture reaches a good boil, remove from heat. Pour the hot boiling cocoa mixture into the bowl of sifted confectioners’ sugar. Add the vanilla and stir with a wooden spoon until smooth. Work quickly so that icing won’t start to set in the bowl. Pour over the brownies and let sit until firm. I have one question, about the frosting. When you say, add the milk and stir in chocolate/sugar mixture, you mean in the sausepan right?? I’ve made these twice within the span of a week, and they are fabulous! Even my husband, who has always preferred a boxed brownie mix to any brownies I make from scratch, gave them the seal of approval. In all my years of baking, I’ve never frosted brownies, but your enthusiasm has inspired me. These are in the oven now. Lostsock, I’m so glad you like Murray’s recipe! As for this one, they’re less chewy (Murray’s are supposed to be with the extra stirring), slightly softer, maybe a little denser? And then of course the icing changes the texture. I like the frosted brownies because of the texture contrasts. Sue, thanks for making them. The icing is really similar to the one I use on Texas Sheet Cake, but the technique is slightly different. The Texas Sheet Cake icing was pourable while I had to spread this a little. I may try using the Texas Sheet Cake icing on my next batch. I may make more of these today. We like these a lot! They’re nice and moist and chocolatey, and you get that nice sugar rush from the frosting. The frosting sort of reminds me of the frosting on Texas Sheet Cake. How would you compare these to the Murray Jaffes perfect brownie. I have been making those ever since you posted the recipe and everyone loves the soft cheweyness(very technical term) of them. Thanks! That’s what I preheated to so they’re going in now. Like we need brownies…..
No, it was me! Sorry, Sue. Temp is 350F. I’m going to the kitchen right now to mix these together. I don’t see what temperature you baked these at. It could just be me. I don’t make brownies that often. For a long time, I struggled with getting the “crust” right at the top. Those look delicious though! I’m also jealous of your Hershey, PA, trip. I think it’d be soooo fun! Perhaps the taste you can’t get rid of is caused by a sinus infection? I always like the look of brownies with frosting, but like the taste of brownies without better. Maybe have to try this one, though to compare. Hmm, I just might give these a bakin’ tomorrow to take to the neighbors who have a new baby. They look great. This looks delicious! I love brownies! These brownies remind me of the ones sold at Bill Miller’s BBQ Restaurant. I’ve loved them since I was a kid, so I’m definitely a brownie frosting type of girl. Hi Anna, If you get a chance, and there are any brownies left after a day or so, let us know how the frosting “held up”. I’ve never been happy with any of the frostings I’ve tried on brownies – they always seem to dry out. This year, for brownies I made as Christmas gifts, I put Hershey’s Milk Chocolate bars on the brownies as soon as they came out of the oven. Obviously, the chocolate melted on it’s own, then I spread it out evenly. I was pretty happy with the results – the chocolate hardened enough that the brownies weren’t messy, it didn’t dry out, it looked nice, and it helped keep the brownies fresh. The recipients all seemed pretty happy with them, too! I’ve never had a frosted brownie before. And I never get tired of seeing your brownie recipes! anna you know i’ve been trying (unsuccessfully) to deep fry brownies. one of these days i’ll get it right. i love having frosting on my brownies. I have to try this out one day. I love your brownie recipes. I’m so glad that the frosting doesn’t have any heavy cream because I don’t have any at the moment. Helena, if you’re going to make them without the frosting then I recommend this recipe. It’s really simple and rich enough so that you don’t need frosting. I love brownies! Filled, topped of plain. Thanks for this post. My favorite brownies are the fudgy ones. No cakey brownie for me. Please keep making brownies, I love them!! Get well! These sound do delicious. It may have something to do with the fact that I’m on a diet. Or that brownies are my favorite thing ever. . . Sorry you’ve had a cold. Me too! I can’t shake it completely.